"Internet: The Challenges of Journalism 4.0"
We will discuss about this during the new meeting of UNINETTUNO’s Digital Talks, devoted to: "The Internet: the Challenges of Journalism 4.0". 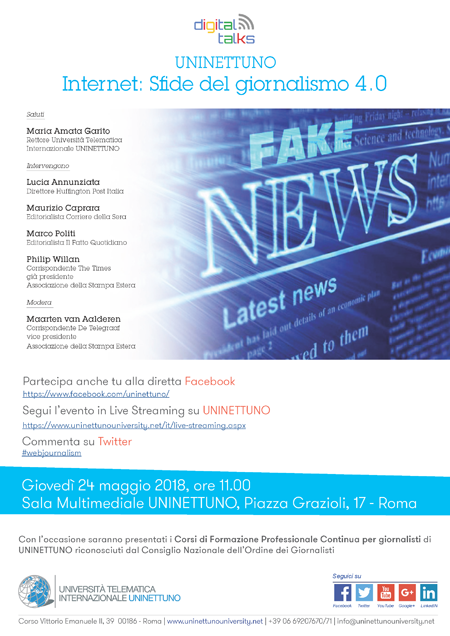 Jointly with the Rector, Maria Amata Garito, there will be Lucia Annunziata, director of "The Huffington Post Italy"; Maurizio Caprara, columnist of "Corriere della Sera"; Marco Politi, columnist of "Il Fatto Quotidiano"; Philip Willan, correspondent of "The Times" who will discuss about this. The debate will be moderated by Maarten van Aalderen, correspondent of "De Telegraaf" and vice president of the Foreign Press Association. This event is included in a cycle of conferences planned by UNINETTUNO in order to reflect on the changes that digital innovation is bringing about in our society. The event will be live streamed on Facebook and on UNINETTUNO website!